And now you know how Matt got started on his path to greatness and injury. Big, BIG thanks to artist Marjorie Rishel for her fine rendering of some pretty disparate locales. I kind of put her through the wringer with this story. Really? I had no idea Swifty was a midwife. I wish Swifty was real just and only so he could hear me call him a midwife. 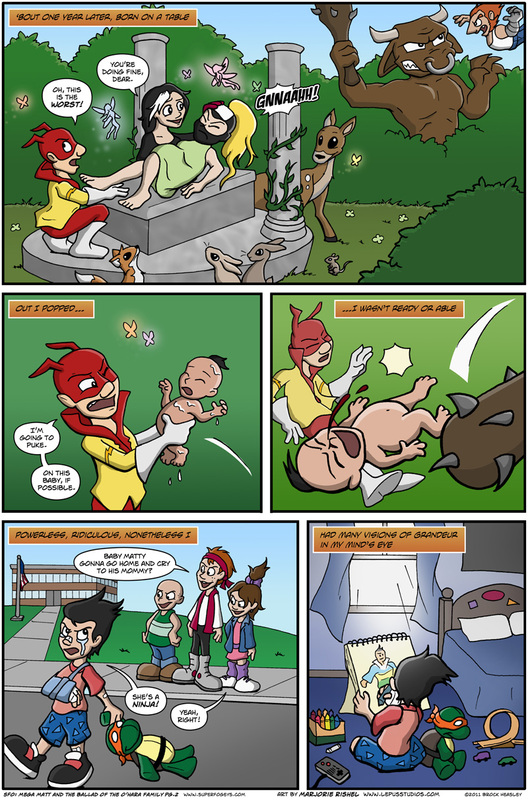 Hmm, looking at this again, I think I should have made Swifty support Baby Matt’s head a little more in panel 2. Oh, well. the next panel makes that a moot point.